Tony Gallichan tells of his groping around for ghoulies at the Spread Eagle Hotel in Midhurst, Sunday 29th February 2004. So, last Sunday saw T and I pootling down to Midhurst in Sussex to raise money for 4Sight, the West Sussex Association for the blind. It's quite beautiful down that part of the county, you know. So different from grey, grimy, concrete Crawley. The place we were going to stay in was the Spread Eagle Hotel. No tittering at the back there! Now this place dates back to at least 1430. It's ancient! And quite, quite wonderful. Full of nooks and crannies. The floors are, well, uneven, to put it mildly.... thank heavens no one was drunk, lol. T and I got there a little early so, after paying 5 quid for a pot of coffee (! ), we ended up popping out for a pub meal. Rather lovely it was, too. When we returned to the hotel, we were shown to the suite where we were to spend the night. The Edward the seventh room was a larg-ish, high ceilinged room full of old beams, seats that ate you when you sat in them and a lovely open fire place that gave me hours of fun, lol. Through a small door was the Queen's suite. This was the room that was rumoured to be haunted. When T and I entered it, the atmosphere was incredibly heavy and oppressive. And T saw something. A woman in a grey dress sat on one of the chairs. She also smelt lavender. Now then, you might think that a little silly. However, shortly after someone else arrived. This was Ann, the Medium for the evening. And she too saw the figure and smelt lavender. T and her hadn't spoken. As soon as Ann entered the room, the atmosphere lightened considerably.. Then everyone else turned up and the room suddenly "emptied". It became blank. Everyone got to know each other a little and had a laugh as the lady from the local paper took piccies. Now, I had jokingly suggested we bring Purcell face's day glo Ghostbuster toys. However, Local Paper Lady had brought a pair of Ghostbuster overalls! 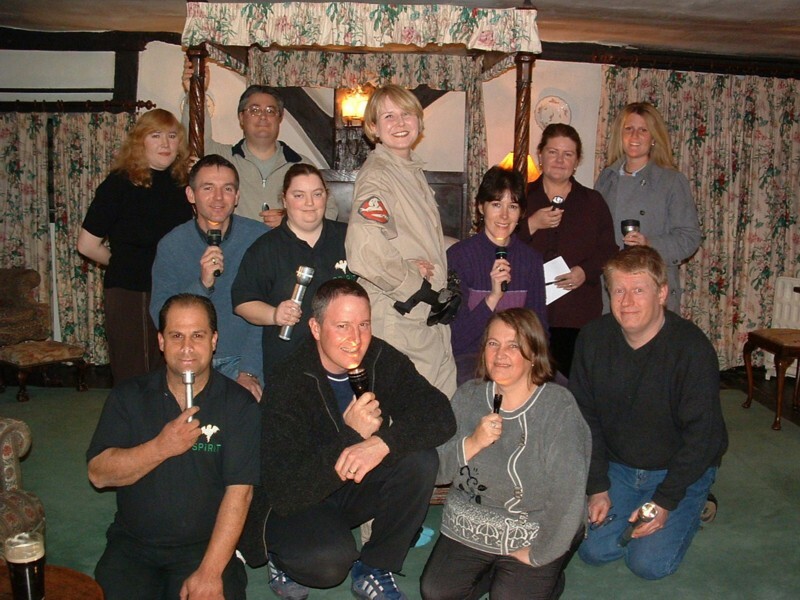 One of the three Sussex Paranormal Society people was good enough to indulge her. So, we settled down. Knowing there was no way I would sleep, I decided it would be fairer on the others if I stayed in the other room later on. Around 3am I popped back in and sat awhile in the darkness. Folk were still awake and that was when the orbs (or Orrrrrrbs, as Bonkers Tom Baker calls 'em) started. There were several, visible to the naked eye. However, they also appeared rather nicely on folks' vid cameras. Hopefully we will have an mpeg of some shortly. And so to daylight. T and I had a wonderful discussion with Ann and her hubby, Andy to do with philosophy and theology. Then it was time for home. There had been a huge frost that night and Sussex looked quite stunning on the way home. Now then, I'm sorry this isn't much of a report, but as folks know, I'm not really a writer. Also, not much really happened. I did get a sort of reading thingy from Ann who was scarily accurate, even though she wasn't really trying! However, all that wasn't the point. The point was to raise as much money for 4Sight as possible. They plan many more of these sponsored sleep overs and both T and I are hoping to go again... stay tuned. 4Sight can be contacted as follows. 1, Longford Road, Bognor Regis, West Sussex, England, UK. PO21, 1AA.